They want to keep their anonymity. They want less important emails to go to a specific email address. So, the first thing you can do to make people give you their “best” email address is to build trust and show them the benefits of the subscription. Make basic subscriber information required and then optionally ask for more detailed information. Another option is to decide what email address is best and then urge the prospect on giving you their good email. “Work-based” emails can be discontinued if the person leaves the organization. A private email may remain live for a long time if this is the user’s main email address. “Work” email addresses can pass from one employee to another. This often happens if a person leaves the job and a new employee takes his place. If the old email owner did not unsubscribe, the new person who inherited the email address can complain that you are sending spam to him (if he doesn’t know that those marketing emails are also inherited). Private emails are not likely to be inherited by other people so the subscriber won’t think you’re spamming if you respect the subscriber’s preferences. Major ISPs and webmail services usually provide feedback loops so you can monitor spam complaints. If your messages don’t reach the subscribers because you are on the ISP blacklist, you can contact the ISP or webmail service and go through the blacklist removal process. Email delivery to work domains may present some difficulties because you never know exactly what systems are processing your emails and how they decide which emails to pass through and which to block. “Private” email addresses may be checked infrequently, for example, every other day or on weekends. A “work” email is likely to be monitored regularly during the working week. A webmail or ISP email address doesn’t provide any information about the subscriber while a “work” email often reveals the subscriber’s origin or organization. Your first option is to reject subscriptions with unfavorable email addresses, forcing the prospect to provide the email you need: a work-related or personal address. You may say something like “We do not accept email addresses from free domains like aol.com, yahoo.com, gmail.com” on the signup page. Note that any restrictions you put on the signup page lead to a lower conversion rate and you get less subscriptions. 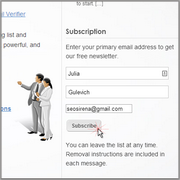 So, you’ll want to make sure that the value you add to your subscription compensates the email address restriction. 2. Ask for the desired email. A less strict tactic is to work the signup form and ask for a particular kind of email address. For example, instead of asking people “Enter your email address”, ask them “Enter your work email address”, or “Provide your main email address”. Even better if you add some value to justify the request for the specific email, for example “Don’t miss our subscriber-only offers: enter the email address you check regularly”. 3. Leave the email choice to the subscriber. The last option is not to worry about what email address the subscriber will provide you with and let them decide themselves what to enter based on the trustworthy and impression your site and signup page produce.